Online platform for Asia’s tech community Tech in Asia will round off its highly vaunted Tech In Asia Conference series for this year with Tech In Asia Jakarta 2015, which will take place on 11 and 12 November 2015 at Balai Kartini. Tech In Asia Jakarta 2015 comes after the highly successful, record-breaking conferences in Singapore and Tokyo earlier this year, and will mark the online platform’s fourth year in Jakarta since it entered that market as Startup Asia in 2012. This year’s edition will see its content extrensively revamped, with a multiple stage format with five different “Expert Stages” each tailored to the biggest trends of today such as mobile, marketing, financial tech, as well as those targeted at developers and students. As with its previous conferences, globally renowned and respected thought leaders in the online space will grace the event’s main stage to share their entrepreneurial journeys or industry expertise, dish out priceless advice and debate the ecosystem’s hottest topics. The Jakarta conference will welcome the likes of Werner Vogels, CTO of Amazon; Thomas Lembong, Indonesia’s Minister of Trade; and Roger Egan, Co-founder and CEO of RedMart. More speakers will be confirmed closer to date. There will also be “Bootstrap Alley”, a sprawling exhibition of startups looking to expose themselves and their product-ready startups to the world. This year, the conference looks set to exhibit some 250 companies over 2 days – the largest tech startup exhibition yet in Indonesia and Southeast Asia. Other mini events within include “Startup-Investor Speed Dating”, “Office Hour” and even “Meet the Media” sessions, to allow startups to interact with those stakeholders in 5-minute quick pitch sessions. Then there’s the every-popular “Arena” pitch battle, which will showcase pitching startups hoping to win USD10,000 in prize money, as well as the attention of investors from all around the world. 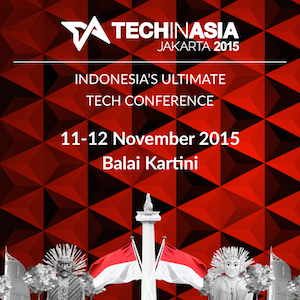 For more information and full event agenda, please visit the Tech In Asia Jakarta 2015 website.